The Asus has finally launched its Gaming Phone “Asus Rog” in India after announcing the phone earlier this year at Computex. We are comparing the device against the OnePlus 6T to see what the company has to offer with its Latest gaming phone against one of the most popular flagship device “OnePlus 6T”. The Asus has announced its gaming phone back in July 2018 at Computex. Now, the phone has finally been launched in India this Thursday. The Asus Rog is the world’s first smartphone with a 3D vapor chamber cooling system. Besides that, the other highlights of the Asus Rog are its ultrasonic Air Trigger touch sensor, an AMOLED display, a 90Hz refresh rate, and a 1ms response time. On the other hand, we have the OnePlus 6T, which comes with an in-display fingerprint sensor, a full HD+ optic AMOLED display, and a Qualcomm Snapdragon 845 processor. 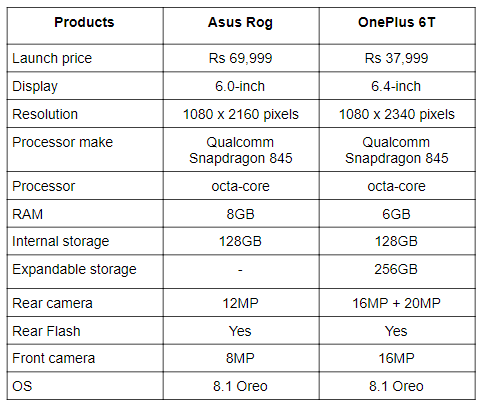 So, let’s compare these two devices to see which one is the right buy for you in terms of specifications. The Asus gaming smartphone “Rog” comes with a 6.0-inch display that offers a resolution of 1080 x 2160 pixels. On the other hand, the OnePlus 6T sports a 6.3-inch display that offers a resolution of 1080 x 2340 pixels. Despite being a gaming smartphone, Rog has a slightly smaller display in comparison to the OnePlus 6T. When it comes to the processor, both smartphones are equipped with a Qualcomm Snapdragon 845 processor. 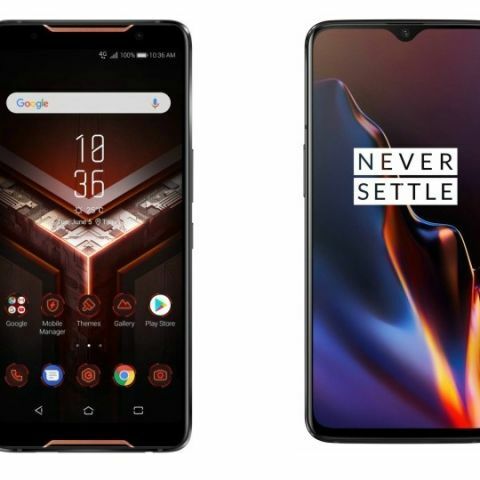 However, the Asus Rog comes in the 8GB/128GB and 8GB/512GB variant, while the OnePlus 6T is launched in 6GB/128GB and 8GB/128GB variant. As far as the cameras are concerned, if you’re particularly looking for a smartphone with a dual camera setup then the OnePlus 6T might fit the bill. The smartphone features a dual 16MP + 20MP rear camera with a 16MP unit on the front. On the other side, the Asus Rog is equipped with a 12MP unit on the back with an 8MP sensor at the front.